Fostex sent me a pair of their newly released T60RP to test out about a month back. This is the next iteration in their RP (Regular Phase) series, following the famous T50RP, which I have only heard as modifications. This product isn't intended to replace the T50RP, but to be a bit of an up-market model. The T60RP employs some of the same orthodynamic technology that has served Fostex well in the past, and I'm glad that I was able to take the time to really put them through their paces. That aside, let's dive into the headphones. The first thing you'll notice about these headphones is their cups. They're made from African mahogany, which Fostex claims is for acoustic purposes. 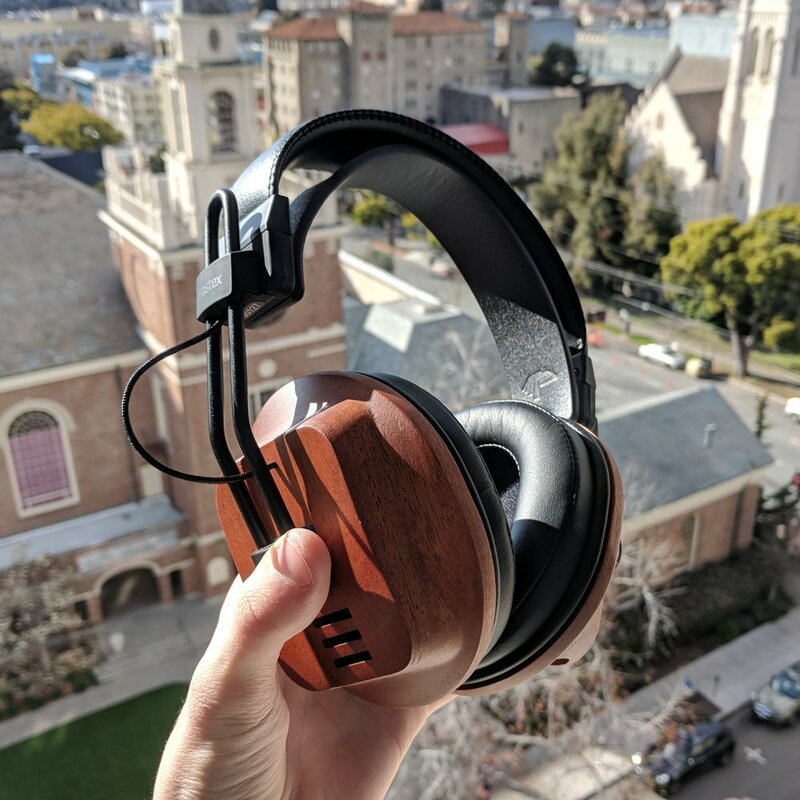 I've always been a bit dubious of that brand of claims, since it really boils down to damping and resonant structures in the earcup, but the inclusion of wood certainly hasn't hurt the performance of these headphones. The headphones use the same hinge for which the RP line has been known, and I have no complaints. Evidently, some users experience creaking sometimes, but I haven't had any issues. The hinge actuates well and keeps the headphones properly sealed on my ears, with little issues. Caliper pressure isn't too high, and I experienced virtually no generalized discomfort in my use with these headphones, even in extended listening sessions. The cable terminates at the left earcup with a 3.5mm TRRS auxiliary connector, while the amplifier end connector is a 3.5mm TRS connector, which is because Fostex offers optional balanced cables as an upgrade option. These have spent most of their time plugged into a 1/4" adapter, and then into my HP-1. I spent a little bit of time with them plugged into my Pixel, but I found that they don't quite get pushed up to the volumes that I prefer. Something that long-term followers of Fostex will probably appreciate is the change of the connector design on the earcup. Gone are the days of the right-angle, locking connector that was included in the T50RP (and, if memory serves, prior models, as well). May it rest in peace; this is certainly an improvement, in my opinion. The cable itself is of good quality, and fabric wrapped. Microphonics are audible, but these are really meant to be at-the-desk headphones, and in my real use, I didn't notice them, except when I tried to elicit them. Overall, the design of these headphones seems pretty robust, but that's to be expected, given that Fostex has had decades to perfect their internal design preferences. Still, I think that's a good thing, as I haven't had any worry about longevity in my use, nor have I had to deal with any unpleasantness that might come up in a headphone from a company that hasn't quite solidified their design. One thing I would like to see revised, and this applies beyond just Fostex, is the earpads - or rather, their attachment. The earpads on these are perfectly fine - if memory serves, they're almost exactly the same as the TH-610 - but I take issue with the way they are attached. They have to be stretched over a ring to be attached, and that process makes swapping pads a complicated affair. Although I understand the trouble with standardization that comes with my preferred implementation, I think it's a worthwhile gap to bridge. I saw this on Campfire Audio's new over-ear, the Cascade; they use a magnetic mounting system that leaves no worry of the earpads incidentally detaching, while making the process of removing them about a million miles simpler. I haven't personally used Master & Dynamic's line of headphones, but I know that they use a similar attachment scheme, and that it's been marked as a success by other reviewers in the past. This isn't a major critique, just something that I rarely see brought up, and that I feel deserves a bit of attention, although I'll admit that this word count might be a bit much - moving on. These headphones are pretty well-balanced - I wouldn't say that they conclusively lean towards any one frequency range. They have a slight bass tilt, but not enough to consider that their primary emphasis. The bass is cohesive and thick, although it lacks a little bit in the speed department. The mids continue to trend towards lushness, with the lower mids getting a little boost. The highs are inoffensive, and add a good sense of crispness to an otherwise dark headphone. Imaging and separation are particularly good, with locational accuracy seeming to be a strong suit of these semi-closed-back headphones. The soundstage isn't extraordinarily radially large, but positioning, in general, is very accurate and satisfying. Isolation is what you'd expect from a headphone of this form factor - better than open-backs, but not quite as good as fully sealed headphones. Leakage at a normal listening volume is audible in a quiet room, but not disruptive. The bass performance of these headphones is a refreshing change for me; I haven't heard a headphone like this in a while. Although not extremely emphasized, the sound is really cohesive and thick - almost cloudy. I think this cloudiness comes from a peak around 40 and 60 Hz, but regardless, it doesn't detract too much from the experience. Although, "cloudy," isn't something that I'd normally consider anything but a bad thing for bass characterization, it's not that negative here. The headphones will get a little bit flustered by extremely fast sections of intense bass, but otherwise, the sound comes across as cohesive and comfortable, although lacking flawless definition. Although in a day-to-day headphone for me, personally, I'd like a bit more definition, this doesn't breach into the territory of what I'd call, "flawed," as a headphone. The mids in these headphones are also interesting to me. The lower mid bump allows a sort of richness and fullness to many instruments that occupy this range. Guitars, acoustic drums, synthesizers, and general strings all have a very satisfying sense of robustness, at the expense of a little bit of detail. This does pull away a bit of fidelity from the vocals, which is the tradeoff, in my eye. But, the vocals certainly aren't bad, and still retain a good deal of intimacy and quality. I had no issues with treble during my time with these, aside from the few bouts of sibilance that I almost always see with certain tracks. The treble is accurate, inoffensive, and adds a good sense of airiness and definition to the headphones. Cymbals are well portrayed, with good detail during attacks and decays. This has become a pretty consistent litmus test for me, and it usually mirrors my experience of the range otherwise. Interestingly, in this case, I found that other ranges of the treble sat a little bit lower in the mix, although this wasn't a particularly bad thing. Overall, I'm a fan of these headphones. They have in no ways broken any molds or shattered any glass ceilings, but they remain very competent - I think that these are a good introduction to the world of nice headphones. They aren't perfect, by any means, but there's not much wrong with them - very little, in fact. With their imaging and separation skills, I don't think that $400 is asking for too much, when considering the increased cost of materials and manufacturing that comes with fully wooden cups. These headphones were provided to me by Fostex. I am not being paid by anyone to write this review, to endorse the product reviewed, or for the content that I put in the review.